Melissa is a professional photographer, naturalist, and guide who has traveled the globe sharing nature and cultures with Off the Beaten Path travelers and others. 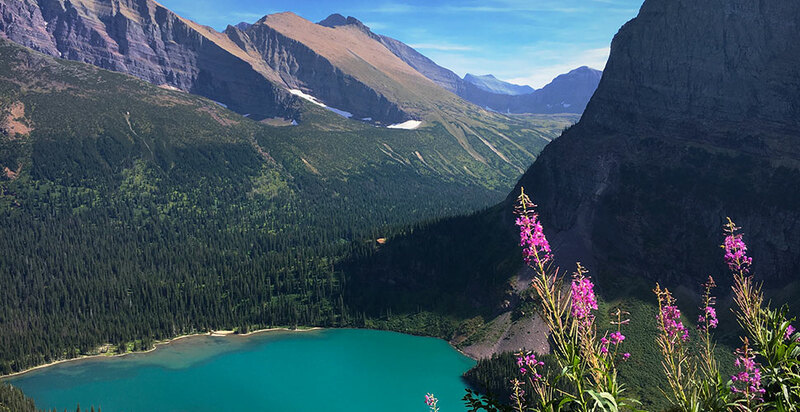 Glacier National Park is one of the last, virtually pristine wilderness areas left in the Lower 48 states. The rugged peaks, forested valleys, and alpine meadows offer refuge to a diversity of flora and fauna found in few other locales. To experience it, I choose to leave the roads behind, step onto the trails, and lose myself in all those things that make Glacier whole. I seek out the quiet places left behind by the bustling world we know today and tune into the language of nature. It always leaves me hungry for more of the intangible poetry quietly whispered on the wind, in the musical flow of waters, or within the melodic notes of birdsong echoing through ancient stands of cedar. John Muir spent time exploring this magnificent landscape in 1901, prior to its designation as our 10th national park. His words defy time, and so eloquently describe the way I feel today, hiking the trails surrounded by the grandeur of these mountains, forests, and meadows. As I mosey down a path, I am awed with the thought of others doing the same for thousands of years before, and glance up at Sinopah Mountain, whose name reflects today’s Blackfeet people. I meander through a meadow bursting with the reds, blues, whites, and yellows of abundant wildflowers. With luck, a moose will be feeding in the pond ahead as Rising Wolf Mountain looms above, reaching toward the sky with its snowcapped layers of reds, browns, and greens. Though the moose is elusive today, the pond reflects a magnificent scene as common yellowthroats chatter in the willow at water’s edge. I drive the Going-to-the-Sun Road to its summit at Logan Pass, and as the forest falls away below me, there is nothing to inhibit a breathtaking view as the jagged peaks of the continental divide stretch off into the distance. The alpine meadows beckon and I have the honor of spending the morning with a family of mountain goats as they graze their way through a field of purple aster. Perhaps today I will hear the telltale “eeep”of a pika as it scampers amongst the talus slopes next to my route. What a treat it would be to observe the daily routine of our “farmer” of the high country as it prepares its hay pile for winter forage. These beautiful little creatures are the smallest member of our rabbit family, though visitors often mistake them for rodents. As our climate continues to warm and plant communities shift up slope, the world of these alpine denizens is sure to change. The question remains . . . are they capable of adapting to this altered biome or will they fade into the past? Of course, I am always scanning into the distance for a glimpse of the one animal that, to me, is the ultimate embodiment of wilderness—Ursus arctos. The grizzly bear is the iconic symbol of all that is wild, and Glacier boasts a healthy, vibrant population that is vital to the continued survival of this sensitive species in the region. Once found throughout much of North America, grizzlies have been relegated to the most remote pieces of land left in the Lower 48 states and are rarely tolerated should they wander far from those safe havens. And while they should always be treated with respect and observed from a distance, they are not the fearsome creatures often portrayed on film and in stories. Going out into bear country with a knowledgeable guide will help you understand how to move in their world safely, and perhaps leave having had the privilege of watching one uninhibited by human interference. As this visit to Glacier comes to an end, I cozy up to a warm fire at the Many Glacier Hotel, one of four Grand Lodges of the National Park Service found here. Built over one hundred years ago, it takes me back in time as I look around to see visitors leisurely sharing stories of their day or quietly reading. A walk through the breezeway finds families spending time piecing together a puzzle or playing a game of Monopoly. I briefly ponder the changes a shifting climate has had on Glacier, and as a guide, want to believe I have inspired others to make a difference. Then I drift off to sleep, filled with a peace that comes from simply knowing this place exists, hopeful about its future, and certain I will always return. Learn more about Melissa and see her photos here. Yellowstone Wildlife Safari: Spring Wildlife Watching. Departures May 12 and May 17, 2019. Zion and Beyond: Hiking Zion, Bryce Canyon, and Grand Staircase-Escalante. Departures May 19 and May 25, 2019. Hiking in Yellowstone: Hiking, Paddling, and a Boutique Tipi. Departures August 3 and August 8, 2019. Crown of the Continent: Glacier and Waterton Lakes National Parks. Departs August 25, 2019. Sonoran Desert Mystique: Saguaro and Organ Pipe Cactus National Parks. Departures September 29 and October 5, 2019.